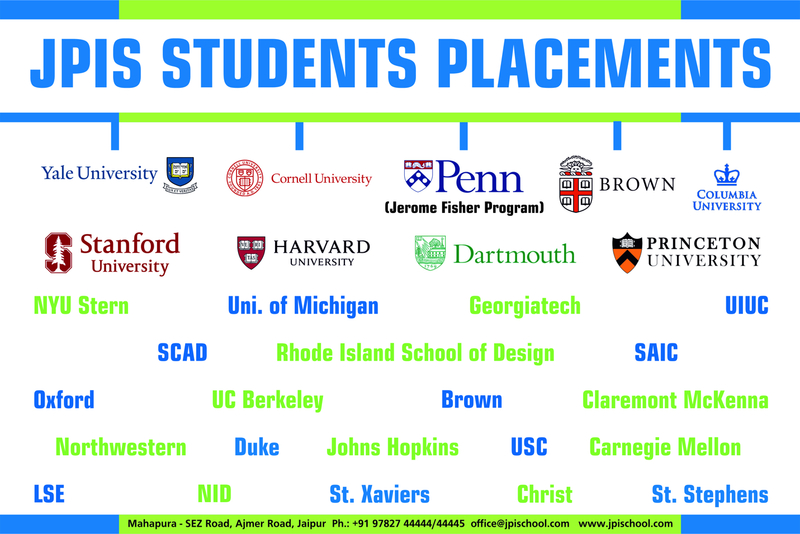 In a historic feat, the JPIS batch of 2017 has made us proud with exceptional college placements. 10 Ivy League Admissions with UPenn (Jerome Fisher), Princeton (Scholarship worth Rs 1 Crore), Yale (100% scholarship), 3 Cornell, 2 Brown and 2 Columbia. Yale- NUS, 3 NYU Stern (2 full scholarships), 9 NYU CAS, NYU AD (Scholarship worth Rs.1.7 Cr), 4 UC Berkeley, 2 JHU, 2 CMU, Rice, Duke, 9 UIUC, 5 GeorgiaTech, Babson, 5 UCLA, 7 BU (including Presidential Scholars), UMich, 2 Rhode Island School of Design and many more. Total scholarship received by the batch of 2017 is more than Rs 30 crores.